Fig. 15-1. Snow construction tools have their virtues depending on the situation, and you should know how to set up either one. A well-made snow shelter is far more secure than a tent. In a storm, as the snow piles up, the snow shelter becomes even more secure while the tent must be continually cleared of snow. Sometimes a snow shelter is the only possibility, such as on a narrow, windy ridge with no space for a tent. A snow shelter requires no special equipment other than a shovel and, sometimes, a snow saw. Even if you use tents for sleeping, a snow shelter is a useful addition for an extended stay in one spot. The snow shelter can be the communal hall where cooking and socializing take place without fear of spilling soup on a sleeping bag or tearing a hole in a tent wall. The extra shelter also serves as a warehouse for equipment and a place of refuge if a tent fails in extreme conditions. On the negative side, snow shelters take time to build; 2 to 3 hours is common. If you'll only be there one night, it may not be worth the effort. Building a snow shelter is hard work and may leave the building crew wet from perspiration and from the snow. In some circumstances a snow shelter is warmer than a tent. But if it's midday and the sun is out, the inside of a tent can be 40 or 50 degrees warmer than the outside air, and makes a great place for drying sleeping bags and clothing. There are pluses and minuses to a number of snow-shelter designs. Check back to Chapter 3 for a look at how to build some of them. Snow caves require both adequate snow depth and the right topography. Look for a fairly steep slope to dig into; it's much easier than trying to dig a cave into a shallow slope. The snow must be deep enough so you won't hit ground before you can excavate a cave that's large enough. With igloos, the depth of the snow is not as critical because they are constructed of snow blocks. Therefore it's usually easier to build an igloo with lots of space and headroom than a roomy snow cave. In addition to a shovel, igloo construction requires a snow saw, experience in the art of igloo building, and good block-cutting snow. If the snow isn't just right, and the snow blocks fall apart as you move them, forget about building an igloo. Snow-shelter construction is a useful skill and it can be fun, but for short winter trips these shelters are not usually practical to build. It is on longer trips, where the investment in the snow shelter can be amortized over several nights or where conditions are too extreme for a tent, that snow shelters are most valuable. Tents are the first choice in shelters for the typical weekend winter outing. A quality winter tent must be sturdy enough to withstand high winds and snow dumped during the night. Steep side walls aid in clearing snow off the tent, and an aerodynamic shape helps outwit the wind. 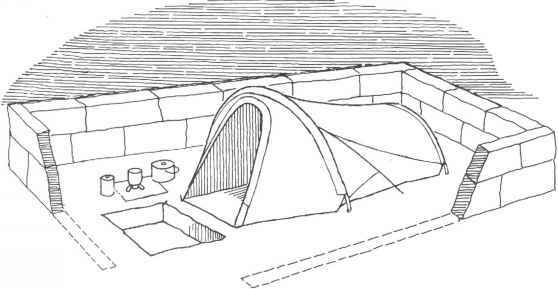 Free-standing dome-type tents work well, and so do the tunnel-style (hoop) tents, which require a few stakes (fig. 15-2). Every winter tent, free-standing or not, needs multiple lashing points for tying into anchors to keep it from taking off like a box kite in a strong gust. The considerations that go into selecting and using a good winter tent apply likewise to tents used for expeditions. Size: For extreme routes, where flat real estate is rare and weight is a supreme consideration, consider the compact and lightweight "wedge" tent, a free-standing design with two poles that go from corner to corner and cross in the middle. On most winter trips, however, you will want a tent that is roomy, though heavy. The extra room is used to store packs and personal gear as well as reduce feelings of claustrophobia during 15-hour nights in the tent. Fig. J5-2. Winter-quality tents: a, hoop style; b, dome. Construction: Although single-walled tents of rainproof, breathable fabric are lighter, double-walled tents (with an integral or separate rain fly) are somewhat warmer and less subject to icing on the inside wall. Aluminum tent poles are usually stronger than fiberglass poles. High-tech poles of such materials as Kevlar or carbon fiber may someday supplant aluminum. Features: Certain conveniences simplify wintertime tent living. These include multiple entrances (in case one entrance bears the brunt of the weather), a vestibule for cooking or storage, gear pockets inside the tent for organizing small items, and inside loops for hanging clothes or a lantern. Use the terrain to your advantage. Select a spot that is as near to flat as possible to make site preparation easier. Watch out for hazards such as crevasses, avalanche paths, and cornices. Observe the local wind patterns: a rock-hard or sculpted snow surface indicates frequent wind, while a loose powdery area indicates a zone where wind-transported snow is deposited. Keep in mind that although the powdery area may be protected from the direct wind, the tent may have to be cleared of snow frequently. Compact a large-enough area for the tent and for movement around the tent to check tie lines or clear snow. Flatten and smooth the tent platform thoroughly to keep you from sliding toward one wall or the other during the night and to get rid of any uncomfortable lumps. This is especially im portant if you're staying for several nights, because the entire tent platform becomes rock hard with all features cast in ice after the first night. A ski does a great job of smoothing the tent platform. Dig an entrance pit 1 foot or so deep once the tent is erected. The pit in front of the main tent door makes entering and leaving easier, as you can sit comfortably in the doorway and place your feet in the pit. Build snow walls around the tent if the site is exposed to winds. The walls can be anywhere from about 3 to 6 feet high and will deflect some of the wind away from the tent (fig. 15-3). Keep the walls as far away from the tent as they are high (a 3-foot wall, for example, should be 3 feet away from the teht), because wind will deposit snow on the leeward side of the walls and fill this area quickly. Blocks cut by a snow saw make the easiest, quickest walls, though you can also just shovel snow into a pile to serve as a wall. A number of special items are useful in winter camping. Fach tent should have a snow brush—a small broom with synthetic bristles to sweep snow from boots, packs, clothing, and the tent. Each tent also needs a sponge for cleaning up cooking or drinking-cup spills and removing condensation from the inside tent walls. A cheery addition to a tent, especially during the long nights near the winter solstice, is a candle lantern. You might even consider a gas lantern, which can repay its price in weight and bother by bringing tremendous brightening and warming to a tent. For anchoring a tent, you can use wide-profile stakes, mini snow flukes, or regular snow anchors. Fig. 15-2. Winter-quality tents: a, hoop style; b, dome. A number of special items are useful in winter camping. Each tent should have a snow brush—a small broom with synthetic bristles to sweep snow from boots, packs, clothing, and the tent. Each tent also needs a sponge for cleaning up cooking or drinking-cup spills and removing condensation from the inside tent walls. A cheery addition to a tent, especially during the long nights near the winter solstice, is a candle lantern. You might even consider a gas lantern, which can repay its price in weight and bother by bringing tremendous brightening and warming to a tent. Fig. 15-3. Typical winter camp: kitchen area, snow walls, and well-placed tent. 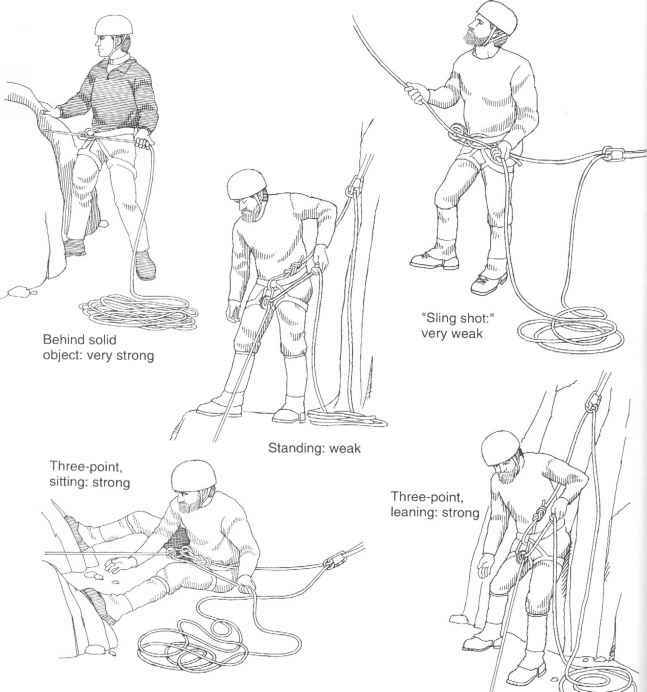 Skis, ski poles, ice axes, and such also work well. Of course, whatever you use to hold down the tent won't be available for other uses. Tie the tent to a tree if there is one nearby. To help make your winter tent-bound hours more pleasant, you need some house rules. 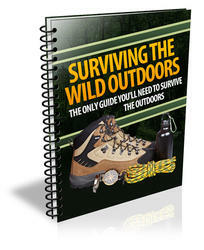 They will depend on the weather, the size of the tent, and the experience of the occupants. For example, a small tent may mean that packs stay outside. If the tent is large enough and packs are brought inside, they should be thoroughly brushed of snow first. House rules may dictate that boots be taken off outside, brushed of snow, and placed in a waterproof boot bag inside the tent. Boots can bring in snow, and they also can cut or tear holes in the tent floor. Use stuff sacks or a large personal tent sack to help you organize and protect personal gear and keep it out of the way of your tentmates. It often helps to have one person enter the tent first to lay sleeping pads and organize gear before others enter. In a severe or prolonged storm, your tent may begin to disappear into the hole created by neighboring snowdrifts. You may need to move the tent up on top of the new snow surface.